Political parties’ election time love is for universal farm loan waiver. Is it really a sustainable solution to the farmer’s distress? This may lead to a situation of recurring demand for farm loan waiver and in turn detrimental to public exchequer. Across the country, Tamil Nadu is considered as a developed state. It has achieved a double digit growth rate during the last financial year (FY) and is looking forward to repeat the performance on coming years as well. The state has an edge on services sector and manufacturing stands second while the primary sector still has about 25 per cent of the state’s GDP. Even though the GDP contribution is lower, the primary sector is the largest employment provider. The state possesses 48% of its area as urban, though largest population resides in rural regions. The state has the history of welcoming any scientific and industrial advancement. It has embraced Green Revolution and has large scale modern industries in its hold. The Green Revolution which came into practice in late 1960s attracted vast number of farmers to produce more and earn significant income by selling food produces. Later most of the food crops and vegetables have been hybridised by the scientists and found their acceptance among farmers of the state. Till to date they rule most of the agrarian landscape. Also Read : Repealing of MSP is the only solution to farmers’ woes? The farmers are in fact under distress inspite of repeated state assistance in many ways and forms and frequently too. Farm loan waiving is one of such steps that have been frequent in the recent past. During the 2009 Lok Sabha elections the UPA had an unexpected win that has to be credited in favour of loan waiver. That promise was praised, later, as a HERO of the victory by then CM of Tamil Nadu, M Karunanidhi. Nearly an amount of Rs 50,000 crores was waived at that time. What is the real reason behind such demand? The cost of production and earnings by selling the products do not match and farmers have to bear the loss and become debtors. At one point of time they commit suicide. So, political parties call for universal farm loan waiver. This time also, the DMK and the AIADMK have made the demand for the same. In the case of DMK, at first they demanded loan waiver for small and medium farmers but on the next day, following demand from other allies, has made a correction to demand a universal farm loan waiver. In order to understand the demand with different perspectives one has to look into relevant factors seen at the state of farm sector in the state. The state has about 71 lakhs ofsmall and medium farmers. Most of them are tenant farmers in one or other. Apart from this, around two lakh tenant farmers are engaged in lands belonging to 17 Mutts in the state. Temples and Mutts together hold 4.78 lakh acres of land in the state. As per an agrarian census in 2010-11, big farmers were operating more than 8 lakh acres. Small and medium farmers operated around 90 lakhs acres. Marginal farmers were operating around 50 lakh acres. On an average, annual income of Tamil Nadu farming household is assessed just above Rs 85,000,on the basis of current prices in 2012-13. This is according to the 70th round of NSSO. Outstanding debts run in lakhs since they are getting fair prices for their products. For example Tamil Nadu pays Rs 16.60 per kg of paddy as Minimum Support Price including additional support sponsored by the State Government in 2017-18. According to the State Agricultural University estimation the cost of production per kg for paddy would be Rs 15.49 in 2014-16 prices. As the cost of production increases even the marginal profit would be practically nothing. Farmers have no other option than to sell their products than keeping them till price gets hiked. They don’t have necessary storage facilities either. Lack of storage leads to frequent slump in prices. Since the farmers are mostly disadvantaged with land small holdings and huge debts on their heads they don’t have enough time to think twice before selling. Also Read : Are small land holdings distressing Indian agriculture? Market prices are too inaccessible and private merchants mostly cheat and exploit them by paying price lesser than the MSP. The major cause for such scenario is land holdings. As majority of farmers are holding less than 5 acres (nearly 2 hectares) they could not attain better bargaining power for their products. Moreover, they have to pay their land owners their due in the revenue accrued. Even big farmers are struggling with huge institutionalised loans. In such case how could farmers expect a better income? Another problem is yield per hectare. Several studies suggest that the actual yield is nearly half the potential yield per hectare. For example, though paddy has potential yield of 6000 kg per hectare, the average yield per hectare was, however, under a range of 3000-4000 kg. Taking into consideration of natural resources and other factors, chances for high yield is restricted in the state. Hence farmers are opting for other professions. They make a cut in inter-crop in paddy like crops and simply survive by that. Therefore, the farm loan waiver would be a recurring demand. The Government of India promises to implement Swaminathan Commission Report to increase the MSP to Cost of Production + 50 per cent to the farmers, given the restriction in the yield would lead to increase in prices of food crops. In turn it would be detrimental to the government exchequer as it has to provide subsidy for poorer sections. 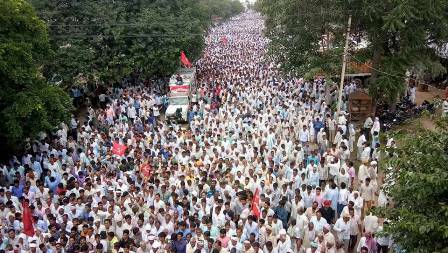 Adding the burden of loan waiver would lead to more chaos than prosperity to the farmers in the end.